Illustrations note XII, 663 p.
Graph theory is a flourishing discipline containing a body of beautiful and powerful theorems of wide applicability. Its explosive growth in recent years is mainly due to its role as an essential structure underpinning modern applied mathematics - computer science, combinatorial optimization, and operations research in particular - but also to its increasing application in the more applied sciences. The versatility of graphs makes them indispensable tools in the design and analysis of communication networks, for instance. The primary aim of this book is to present a coherent introduction to the subject, suitable as a textbook for advanced undergraduate and beginning graduate students in mathematics and computer science. It provides a systematic treatment of the theory of graphs without sacrificing its intuitive and aesthetic appeal. Commonly used proof techniques are described and illustrated, and a wealth of exercises - of varying levels of difficulty - are provided to help the reader master the techniques and reinforce their grasp of the material. A second objective is to serve as an introduction to research in graph theory. To this end, sections on more advanced topics are included, and a number of interesting and challenging open problems are highlighted and discussed in some detail. Despite this more advanced material, the book has been organized in such a way that an introductory course on graph theory can be based on the first few sections of selected chapters. Graphs.- Subgraphs.- Connected Graphs.- Trees.- Nonseparable Graphs.- Tree-Search Algorithms.- Flows in Networks.- Complexity of Algorithms.- Connectivity.- Planar Graphs.- The Four-Colour Problem.- Stable Sets and Cliques.- The Probabilistic Method.- Vertex Colourings.- Colourings of Maps.- Matchings.- Edge Colourings.- Hamilton Cycles.- Coverings and Packings in Directed Graphs.- Electrical Networks.- Integer Flows and Coverings. developed by Paul Seymour and Neil Robertson and followers), which certainly now deserves a monographic treatment of its own. Summing up: Recommended. Lower-division undergraduate through professional collections. This book is a follow-on to the authors' 1976 text, Graphs with Applications . What began as a revision has evolved into a modern, first-class, graduate-level textbook reflecting changes in the discipline over the past thirty years... This text hits the mark by appearing in Springer's Graduate Texts in Mathematics series, as it is a very rigorous treatment, compactly presented, with an assumption of a very complete undergraduate preparation in all of the standard topics. While the book could ably serve as a reference for many of the most important topics in graph theory, it fulfills the promise of being an effective textbook. The plentiful exercises in each subsection are divided into two groups, with the second group deemed "more challenging". Any exercises necessary for a complete understanding of the text have also been marked as such. There is plenty here to keep a graduate student busy, and any student would learn much in tackling a selection of the exercises... Not only is the content of this book exceptional, so too is its production. The high quality of its manufacture, the crisp and detailed illustrations, and the uncluttered design complement the attention to the typography and layout. Even in simple black and white with line art, it is a beautiful book. "The present volume is intended to serve as a text for "advanced undergraduate and beginning graduate students in mathematics and computer science" (p. viii). It is well suited for this purpose. The writing is fully accessible to the stated groups of students, and indeed is not merely readable but is engaging... 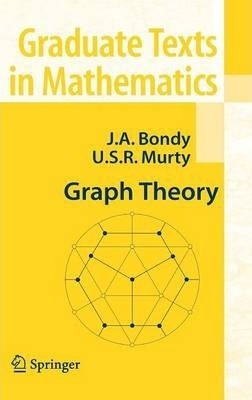 Even a complete listing of the chapters does not fully convey the breadth of this book... For researchers in graph theory, this book offers features which parallel the first Bondy and Murty book: it provides well-chosen terminology and notation, a multitude of especially interesting graphs, and a substantial unsolved problems section...One-hundred unsolved problems are listed in Appendix A, a treasure trove of problems worthy of study... (In short) this rewrite of a classic in graph theory stands a good chance of becoming a classic itself." This book is a follow-on to the authors' 1976 text, Graphs with Applications. What began as a revision has evolved into a modern, first-class, graduate-level textbook reflecting changes in the discipline over the past thirty years... This text hits the mark by appearing in Springer's Graduate Texts in Mathematics series, as it is a very rigorous treatment, compactly presented, with an assumption of a very complete undergraduate preparation in all of the standard topics. While the book could ably serve as a reference for many of the most important topics in graph theory, it fulfills the promise of being an effective textbook. The plentiful exercises in each subsection are divided into two groups, with the second group deemed "more challenging". Any exercises necessary for a complete understanding of the text have also been marked as such. There is plenty here to keep a graduate student busy, and any student would learn much in tackling a selection of the exercises... Not only is the content of this book exceptional, so too is its production. The high quality of its manufacture, the crisp and detailed illustrations, and the uncluttered design complement the attention to the typography and layout. Even in simple black and white with line art, it is a beautiful book.